"I suggest you spell out a valid criticism before you make a debacle of yourself in this thread again"
Sweetie I haven't made a "debacle" of myself. And that was my bad, I should edit my comment to say this seems useless to me. I see no point in giving a "valid criticism" because anytime someone gives you one on your other post you either try insulting them or ignoring them. Another "epic" "idea" from "Bartin". I like the idea, although not exactly in your sense. Bartin, this is your suggestion. You. Cannot. Let. Mojang. Make. The. Rest. We've been over this. It's not an epic idea. It's not an epic idea. It's not an epic idea. Anyways, better idea so far, but you gotta learn the rest of what we've said over your 3--5 suggestions. "I wouldn't go for the dying in cold water" Are you perhaps unfamiliar with the "Titanic" disaster of 1912: ... 2,200 people enter the water... only 700 make it out. Water around icebergs is something to be truly feared -__- and "dying in cold water" is not a far-fetched concept True. However. This is a kids game dude. I understand you can die in cold water. This is a game, people would hate it more than like it. I need to note, are you saying the Titanic wasn't actually the Titanic? "iceberg itself as a biome i'm not a big fan of" Hmm ... perhaps it could have a "semi-rare" chance to generate in the "deep ocean" biome ... or the "frozen ocean" biome could be repurposed to include it -__- (although this would require other adjustments to be made to the "frozen ocean" biome :2) Under this new "idea" the iceberg becomes another of Mojang's "pre-generated" structures .... -__- it could perhaps work Sure. "If mobs were on it as well, new mobs, it'd be cool" Penguins perhaps? Or if we want to remain in the realm of "Minecraftian Fantasy" then perhaps an aggressive mob that is Mojang's take on the Himalayan myth of the "Yeti" -__- PENGUINS. YES BARTIN. A GOOD IDEA. Yeti works too. "anytime someone gives you one on your other post you either try insulting them or ignoring them." I appreciate feedback when it is correctly given by someone who attempts to be -__- knowledgeable Evidently again, you are not knowledgeable if you don't take advice and instead insult people with your quasi-poetry. "how about sharks" We have the "Guardian" mob already which fills a similar purpose -__- Guardians and sharks are not the same. Quite different. Overall, you're still using quotations wrong, still using "-_-" for whatever you're using it for. Wait what? No epicness? Good job Bartin! I don't see how this biome poses any danger, just an annoyance, all you do is go around it, or just break your boat and walk over it. No danger. [Edit]: Noticed more flaws about the biome. Support withdrawn until the idea is cleaned up. I like the idea in some parts, as it could serve as an ideal new ice biome. However, despite the fact that Icebergs exist in this new biome, the biome climate itself shouldn't be a cold biome. This is because if it was a cold biome, the ocean that the Icebergs reside in would freeze over. In other words, it wouldn't really be an ocean with Icebergs in it; it would be more of an icy plain with ice spikes littering its surface. And the damaging aspect of the water would be annoying instead of a challenge. After all, Gameplay>Realism. And what are these new sunken ships you speak of? What exactly is their layout? Do they have any rooms or loot inside of them? And judging by the observations of the other critics, these icebergs are little to no danger. As of 1.9, boats are becoming much more resilient. Overall, though the Iceberg Biome itself is neat, the danger that you claim it will bring isn't going to work, and the unique features of the biome only degrade the suggestion. Oh.. Iceberg. Sound not special. Since 1.9, boats can't crash land anymore. And it's easy to see BIG iceberg from distance. How you'll implement the cold water? I don't want freezing in water. Look at frozen river biome. Did you froze in there? No. How many time WE have to say, NEVER LEAVE YOUR SUGGESTION TO MOJANG!!!!. Sunken ship, probably yes. I want sunken ship with loot and danger. It's. Not epic. At all. Well, i support sunken ship. But not the biome. It's easy to avoid iceberg in middle of nowhere. 1.) in Minecraft, the elements don't hurt you. Besides, it is awkward to suggest that the water deal periodic damage as opposed to adding some heat loss system. It sounds very frustrating and un-fun. 2.) 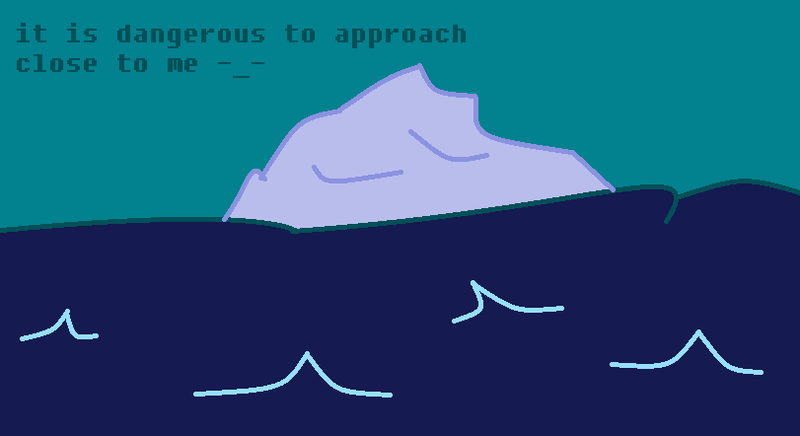 The player can probably easily avoid the icebergs, and any failure to do so is probably more the fault of a lousy interface than of the player's own navigational skills. I have to agree that normally oceans are supposed to be a real challenge. But this idea just won't make travelling oceans harder. Peoplecould just avoid the biome and sail around it easily. This is truly an epic biome and will put the "fear of god" back into the hearts of -__- adventurers fear of God means respecting God or believing in him, so what was this sentence supposed to mean again? "I wouldn't go for the dying in cold water" Are you perhaps unfamiliar with the "Titanic" disaster of 1912: ... 2,200 people enter the water... only 700 make it out. Water around icebergs is something to be truly feared -__- and "dying in cold water" is not a far-fetched concept real life, not Minecraft which doesn't include every single feature from real life, also "Titanic" are you saying it wasn't titanic? "how about sharks" We have the "Guardian" mob already which fills a similar purpose -__- guardians are a species of fish from the order cyclopidae, they have one singular eye and have the ability to shoot lasers and have protective spikes on their back, they are the main predators of squid, how is that like a shark? Minimal support, I don't see myself dying in this situation, plus it seems unnecessary, I would prefer some sea monster thing, even if it is more redundant than this. Cleaned up the thread a little bit, and removed some of the posts that were kind of off topic (posts about if they should post, responses to posts that no longer exist, that kind of thing). If you see a post that you think is breaking the rules, report it. Moderators cannot see everything. Well, i do like the suggestion adding a generated structure. But it just dawned on me that how big are this ice bergs? Are the ice bergs rare? But to be honest dosen't it seem odd that "cold water" hurt a player. Even though that temperature in Minecraft would seem a little bit odd? Also to sum it up in a pretty ribbon, how would this be a threat to a player, if the player can just stir away? and swim into the sunset. It's a lovely suggestion i have to admit but, Aside from making the ocean a bit more better, how would the ice berg strike fear into the player. If the player can just simply swim around it. "I wouldn't go for the dying in cold water" Are you perhaps unfamiliar with the "Titanic" disaster of 1912: ... 2,200 people enter the water... only 700 make it out. Water around icebergs is something to be truly feared -__- and "dying in cold water" is not a far-fetched concept He didn't mean it would be far fetched, he just meant it wouldn't fit minecraft well. And I agree with him, a biome that causes you to freeze? I think it should be ice causes nearby water to become cold, and instead of taking damage, you should become slower. I think this would fit more with the theme of minecraft. "iceberg itself as a biome i'm not a big fan of" Hmm ... perhaps it could have a "semi-rare" chance to generate in the "deep ocean" biome ... or the "frozen ocean" biome could be repurposed to include it -__- (although this would require other adjustments to be made to the "frozen ocean" biome :2) Under this new "idea" the iceberg becomes another of Mojang's "pre-generated" structures .... -__- it could perhaps work I think this idea would fit better as a generated structure instead of a biome itself. "If mobs were on it as well, new mobs, it'd be cool" Penguins perhaps? Or if we want to remain in the realm of "Minecraftian Fantasy" then perhaps an aggressive mob that is Mojang's take on the Himalayan myth of the "Yeti" -__- Any mobs that spawned on the iceberg would also make sense to spawn in snow biomes as well though, so they wouldn't be exclusive to the iceberg.... unless there was some kind of special ice boss maybe? Minecraft needs more bosses, I think the Yeti would fit well. Or what about a Giant Squid that attacks the iceberg? They both sound cool to me. "how about sharks" We have the "Guardian" mob already which fills a similar purpose -__- Guardians work vastly different, they shoot lasers and only spawn in generated structures. But imagine sharks that spawn randomly all over the ocean, then riding boats would no longer be very safe, which is why you made this idea right? Please refrain from using excessive -__- faces and quotation marks. Good idea, but vague. Flesh it out more. For once, this makes minimal sense. Thank you Bartin for dialing the 1800s-speak down a couple hundred notches. You still have a few hundred to go, though. I'm not so crazy about dying in freezing water, so maybe there could be a way to prevent this? You couldn't explore the sunken ships if you die before you get there! Also, I wouldn't call the wooden boat "a traveling sea vessel" since it only has room for two. I think icebergs should generate as structures instead of biomes, to simplify things and give a little flexibility for generation. However, a large field of icebergs would be an interesting biome. But I'm all for the sunken ships and the icebergs. Its kinda hard to crash into things with boats nowadays, especially gigantic ice masses that starkly contrast with everything around them so maybe the boat breaking mechanic isn't necessary. Maybe there could be a rare abnormally large icebergswith a village on it? Just an idea. Your overuse of quotation marks and -___-'s disturbs me. Why would you do that? On topic, this suggestion just doesn't bring much to the table. An unfitting freeze mechanic and a gigantic mass that is plainly visible, and is basically unhittable. This simply doesn't fit. Like, what is the point?